Sony Cyber-Shot DSC-G1: Too Much for a Good Thing? Sony is as good as anyone at squeezing lots of functionality into compact devices. 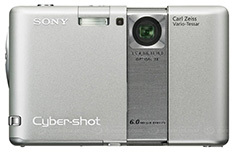 The new Sony Cyber-Shot DSC-G1 is an amazing example of Sony ingenuity. This compact camera includes a beautiful 3.5" LCD, 6-megapixel sensor, image stabilization, 3X optical zoom, 2 GB built in memory, WiFi connectivity, MP3 player (with headphone jack), movie recorder, ISO up to 1000, and very stylish design. All of this for about $450. Wait... $450 for a 6-megapixel camera? Well, it's not totally without merit. The screen is absolutely beautiful... and big. The onboard memory is nice, as well as the WiFi for sharing images, although neither are really necessary as implemented in this camera. The image stabilization is very good. And that is a Zeiss lens on the front. On the down side, it is a slow reacting camera with image noise at moderate ISOs. If you want more details, I recommend the review recently posted on PhotographyBlog.com. They do a good job of weighing the pros and cons. This is a beautiful looking device, however. And Sony does include lots of goodies. If you've got the money, it's a tempting digicam for on the go.